In all honesty, it feels like my perfume collection grows a ridiculous amount every month; although most people would also likely say that my perfume collection is excessive, but... I absolutely adore having a pretty set of bottles stare at me from every angle of my room and I wouldn't change it in any way, shape or form. My favourite kind of perfume bottle are usually the brightly coloured, very pink, sparkly and floral kind. Which is why I've been in love with the Marc Jacobs Daisy scents for a long time; I'm talking about before I even owned any of them, back when I was in school and used to read Vogue and other magazines, wishing I would one day earn enough money to spoil myself with nice things. Daisy Black Edition is a relatively new find for me collection; it's supposed to be the 'luxury version' to the original Daisy, but for me personally I love the way that it looks. The mixture of the harsh black bottle paired with shiny golden daisies that make up the lid is something that genuinely appeals to my tastes. The fragrance is actually the same as the original Daisy and as this one is more expensive I decided to be a massive cheapskate and buy an empty bottle for all of £3 from eBay instead, as ultimately I wanted this bottle for the looks and not the smell. As it was released in 2008, it was relatively difficult to find cheaply full, anyway so I'm not missing out at all. 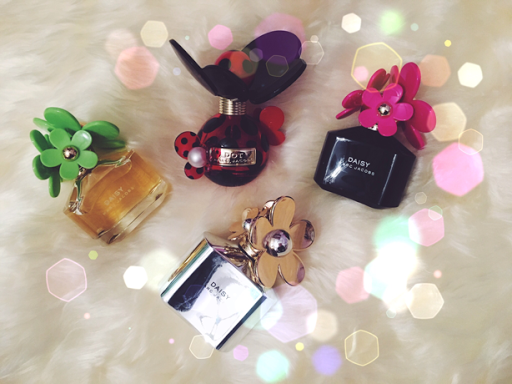 I love how it looks with the other Daisy Perfume bottles. Another bottle that I'd been online and been actively lusting after was Daisy Hot Pink; I actually thought that I'd never manage to find this bottle as the fragrance was released in 2011 but I actually struck lucky on eBay. I was bidding on what I thought was an empty bottle but when it arrived I found out it was actually half full, so for £10 I was incredibly chuffed. The bottle is very similar to the Daisy Black Edition with a black bottle base and three hot pink daisies with gold centres. With notes of strawberry, gardenia, violet, jasmine, birch and cedar it's a very wild forest smell and I find that it feels nice against the skin, but ultimately I love how it looks with its sister fragrances on the dressing table. Another successful but unexpected eBay find was Daisy Bloom which, incredibly was brand new in box and cellophane, so for £24 it was an absolute steal. It was released in 2009 so I was super excited to find it so unexpectedly; the bottle is very similar to the original Daisy but with leaf green daisies on the lid instead of white. It's brightness somehow reminds me of long summer days and the scent itself is actually the same as the original Daisy which was a bit of a disappointment as I was hoping that it would be a different fragrance but I still love it a lot. It's a full 50ml bottle and looks great as a cute addition to my collection. The last two new additions to my perfume collection are Dot and Daisy Silver Edition, both of which are empty bottles. I'm planning to buy a full Dot perfume as I've fallen in love with the style of this bottle. I love how the red and black polka dots give the illusion of a ladybug that is embodying a flower and the pearls are a nice added detail. Whereas Daisy Silver Edition was a bit of a random buy and for an excellent price. It's a 100ml bottle, with a metallic silver bottle and metallic gold Daisy petals that make up the lid. The centre of the daisies are metallic silver to match the bottle. Released in 2009, I was never expecting to find this perfume and even better for £6! I thought it was an empty bottle but there is probably 20ml left so I've had a smell of the fragrance but unlikely to use it much as I don't have a lot of it to use. A variation of the original Daisy, this version adds strawberries, violet, pink grapefruit, gardenia, jasmine and vanilla which makes it feel very feminine and fairly woody and wild. If I could find a full version, I would without a doubt.